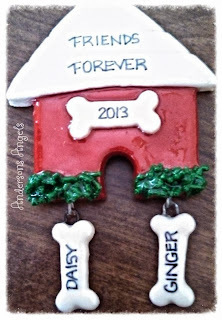 I have always been a fan of personalized things especially Christmas Ornaments! While growing up my Grandma would make a special Ornament for each grandchild for her tree. Though back then it was just a colored ornament with our name and birth date on it, it meant a lot to have one because we knew they were made with love. With times changing I wanted to find somewhere I could get really cute personalized ornaments to add to my families tree. Ornaments with Love is that site! 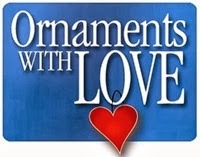 At Ornaments with Love you will find such a awesome selection because they have ornaments from many suppliers; not just one! Plus they carry ornaments for literally every occasion you can think of from professions to pets/animals and everything else you could imagine. I am a big fan of their family ornaments, but since baby will be here before Christmas and we do not know baby's name I didn't want to get a family ornament just yet. So I found a really cute one under the pets/animals section for our two dogs. I tried to find one with 2 dogs and a cat but was unable to find one. At Ornaments with Love they know that a personalized ornament will only please a customer if the personalization is done in a professional manner. That is why all of the workers doing the personalization of the ornaments at Ornaments with Love have excellent handwriting that adds to the beauty of the ornaments. It's important to remember when ordering your ornament that the handwriting will most likely not look exactly like it does in the stock photo, but it will be held up to the same standard of excellence. 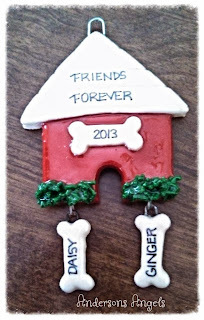 I am so happy with our dog's ornament! I can't wait to display it on our Christmas tree this year! If you are looking for the perfect personalized Christmas ornament for your tree then make sure to check out Ornaments with Love. Plus they make the perfect Christmas gift for that hard to buy for person because everyone is sure to love a thoughtful gift of a personalized ornament for their tree. How would you like to WIN a personalized Ornament for your families tree or to give as a gift? If you would then make sure you enter the form below!! I would get the Train Family of 4 Christmas ornament! MY boys LOVE trains so it would be perfect! I actually already have an ornament from them this year, but I'd love to get one of the Family of 3 ornaments for my sister since they have a new baby :). I would choose the family house ornament. I think I would get the baby's first christmas with the bell and hearts for my friend who just had a baby! I would choose the Personalized Fireplace Christmas Ornament with 3 Stockings. I like the Personalized Banister Family Christmas Ornament of 4.
i would choose the 2 Children & Baby ornament. I would choose the Personalized 1st Christmas Christmas Ornament Snowperson - Blue if I won, to commemorate my youngest son's first Christmas this year! Personalized Baseball Christmas Ornament with Christmas Hat. We are a baseball family. I'd get the Personalized Dog House Frame Christmas Ornament. I'd love to have the Personalized Frog Couple Christmas Ornament. I'd choose the airplane with bear one.